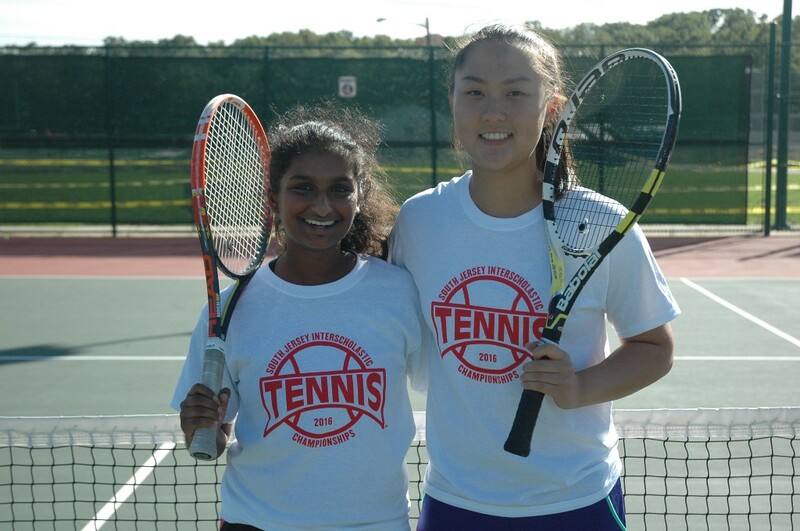 Rebekah Colacot and Sarah Jang form a dynamic duo at first doubles for Cherry Hill East girls’ tennis. Senior Sarah Jang and junior Rebekah Colacot barely knew each other when girls tennis head coach Mary Jewett paired the two up as the Cherry Hill High School East Cougars’ second doubles team in 2015. More than a year later, Jang and Colacot are more than just partners. They’re key contributors to the girls tennis team, one of the better doubles teams in all of South Jersey, and, most importantly, they’ve become close friends. Jang and Colacot are having a very successful season on the court in 2016. Now the first doubles team for Cherry Hill East, Jang and Colacot entered the Cougars’ first postseason match on Oct. 10 with an undefeated record during the regular season. Recently, the pair established itself as the doubles team to beat in South Jersey after winning the South Jersey Interscholastic Championships, a tournament featuring schools from all over the region. There are a few keys to Jang and Colacot’s success. The two complement one another with a unique skill set. Jang is a solid player at the net with the ability to land volleys in key spots. On the other hand, Colacot has a strong groundstroke and can rocket the ball to the opposite court, especially on her forehand. During their first season together in 2015, Jang and Colacot won a ton of matches at second doubles, including earning one of Cherry Hill East’s two points in the State Group IV semifinals against Montgomery High School. This season, Jang and Colacot stayed together at first doubles. Not too many doubles pairings play multiple years together in high school, with players constantly graduating or moving up to play singles. Jang and Colacot felt they entered this year with an advantage. Another advantage the pair has is their relationship with one another. Tennis has brought Jang and Colacot closer to one another as friends, which helps translate to success on the court. Jang and Colacot are just one component of a very strong East girls tennis team. Sisters Stephanie and Natalie Yanosov have been strong at first and third singles, respectively. The Cougars have also benefitted from the play of freshman Pallavi Goculdas, who has dropped only two matches at second singles this year. “Knowing that Steph and Natalie would come back, we knew we’d have a strong team,” Colacot said. “I know we’re better than last year because our key players are stronger,” Jang added. Jang and Colacot are hoping to guide Cherry Hill East to a second straight South Jersey Group IV championship and possibly into contention for its first state championship since 2004. As a pair, Jang and Colacot are also competing in the NJSIAA Doubles Tournament, which was scheduled to begin Oct. 8 and 9, but has been postponed to next weekend due to rain. This year will be Jang and Colacot’s final season together, with Jang slated to graduate next June. Colacot said there’s no doubt she’ll miss her partner next year.